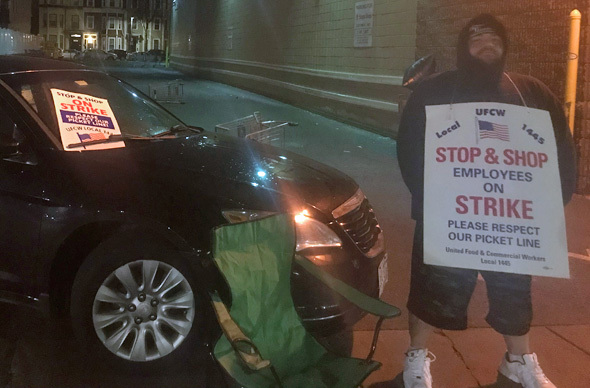 Roving UHub photographer George Carroll Jr. reports that at 11:50 p.m. on Thursday, in the cold and rain, he spotted Geoff Applegate maintaining a solo picket outside the Stop & Shop on East Broadway in South Boston. The store wasn't open to the public but, Applegate told Carroll, he was there in case the company tried making a delivery. The Boston Business Journal details her case, which includes allegations Digital First Media forced her to cut back on a second job even as it was letting male counterparts keep theirs and piling new responsibilities on her with no increase in compensation, unlike male counterparts who became eligible for new bonuses after the company picked up the paper in bankruptcy court. After Christine Fontánez's video of Roy Bourque coming out of the North Andover Stop & Shop this morning started spreading, the former Bruins player responded: Read more. 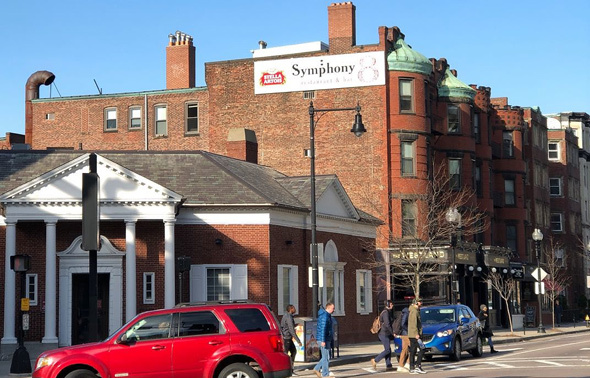 The owners of a marijuana shop proposed for Maverick Square decided not to risk going before a zoning board short one member today and requested and got a deferral until July 9, to make their case before a full, seven-member board. Read more. Boston Restaurant Talk reports the impending end of the Craft Beer Cellar franchised shop in Fort Point, even as the Craft Beer Cellar in Roslindale was having its final days. The New York Times reports New York Mayor Bill De Blasio, of the Cambridge De Blasios, came up to our fair Hub for a bit of fundraising with some secret backer whom he declined to name, but whom the Times reveals is our own John Fish, whose Suffolk Construction has begun bidding on projects in New York. WGBH reports the state gaming commission is looking into two allegations - and how executives at the company, still named for Wynn, that owns the casino handled them as it gets ready to make the final determination on whether the place can open. A federal judge says a man who sued L.L. Bean over a pair of slippers it refused to replace after it eliminated its lifetime return policy last year really shouldn't have. Read more. The Zoning Board of Appeal today approved marijuana shops at 430-454 Blue Hill Ave. in Grove Hall and 591 Albany St. in the South End. In both cases, the approval does not mean the shops can actually open, only that they can now apply to the state Cannabis Control Commission, which would have to decide whether to grant licenses. Read more. A decision by the mayor's office to approve two marijuana shops less than a half mile apart - in potential violation of a city ordinance - sparked an unusually volatile Zoning Board of Appeal meeting today, during which the board chairman slammed his gavel to the table to restore order at one point, not long after he yelled at a city councilor that she was out of order. Read more. Roslindale Craft Beer Cellar owner Bryan Reeves announced today he's shutting his store in the basement of the Roslindale Square substation. Reeves says he will stay open as long as he still has stock left - which he'll be discounting 25% starting Tuesday. Read more. Jamaica Plain News reports AAA Appliances on Centre Street, near the Monument, could be replaced by a pot shop, if approved by the city and state. The appliance store would then move somewhere else, either in JP or West Roxbury. Read more. The state Cannabis Control Commission today granted permission to NETA to open its expand its existing medical dispensary in Brookline Village to sales of recreational pot starting Tuesday. The dispensary is in the big old bank building at the corner of Washington Street and Rte. 9.